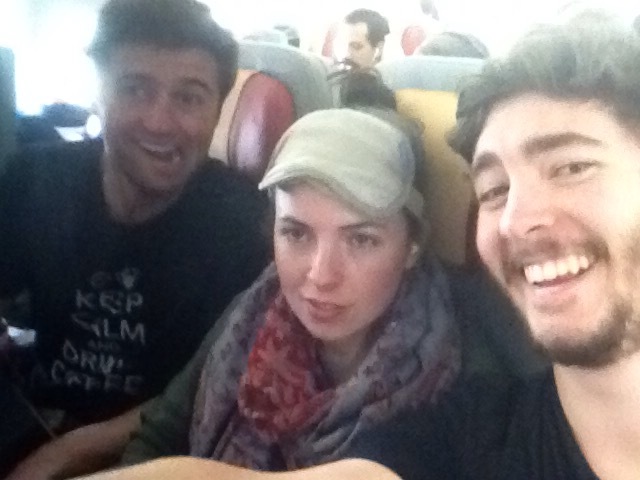 Following a trip that felt more like a dream-come-true, the gang boarded its first of a two-part flight back to the US, and, after a few seat-switching bargains, this quick selfie was taken to illustrate the joy Sicily had instilled within us, despite our dismay at the prospect of returning to a cold, snowy Brunswick. Beyond learning so much about Sicily and even the world, this trip galvanized old friendships and blossomed new ones. I’ll never forget the experiences and happiness we shared! We are no longer Sicilian Padawans, but Sicilian Jedi masters. Especially Anna. 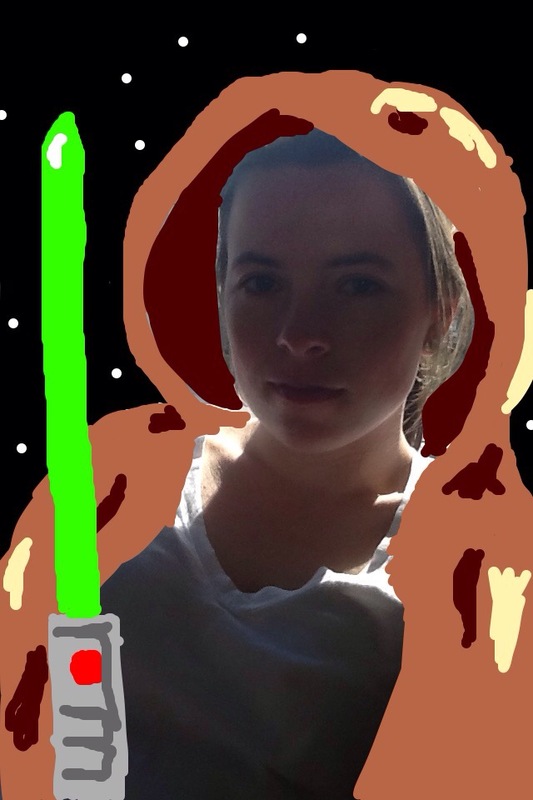 The force is strong with that one. This marks our final full day of touring Sicily. As our bus approaches the ominous, pulchritudinous shadows of Mount Etna, I cannot help but note that this outing is, allegorically and literally, the climax of our trip. For millennia, Sicilians have derived both divine and monstrous connotations from this volcano, worshipping it through the use of its volcanic rock in much of the area’s architecture, and demonizing it in mythological and literary comparisons to a cyclops or a dramatic, disastrous result of nature. As the soil surrounding the volcano is incredibly fertile, farms have taken up post despite the threat of an eruption, and companies have taken over the mountain to reap all possible rewards from its waves of tourists. 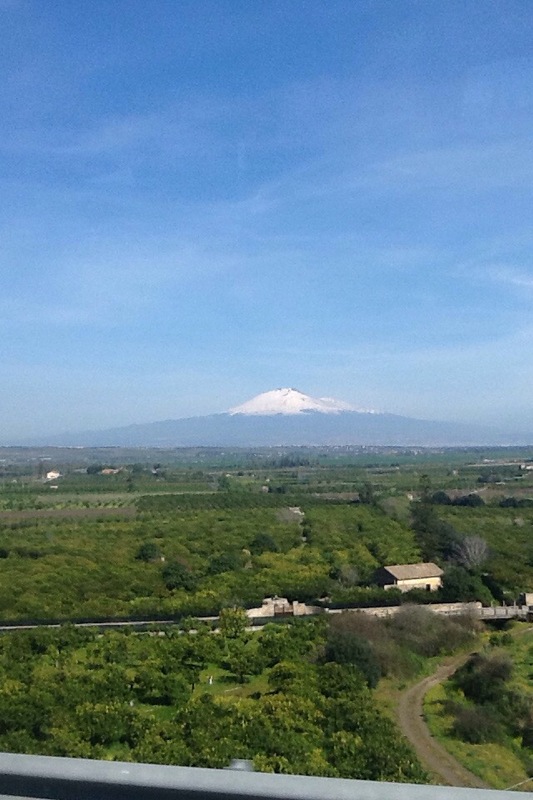 In many ways, Etna is one of the only static symbols of Sicily, and one that Sicilians can rely on, while the rest of Sicily’s history is arguably as dynamic as can be. Being at Etna’s summit literally and figuratively took my breath away. 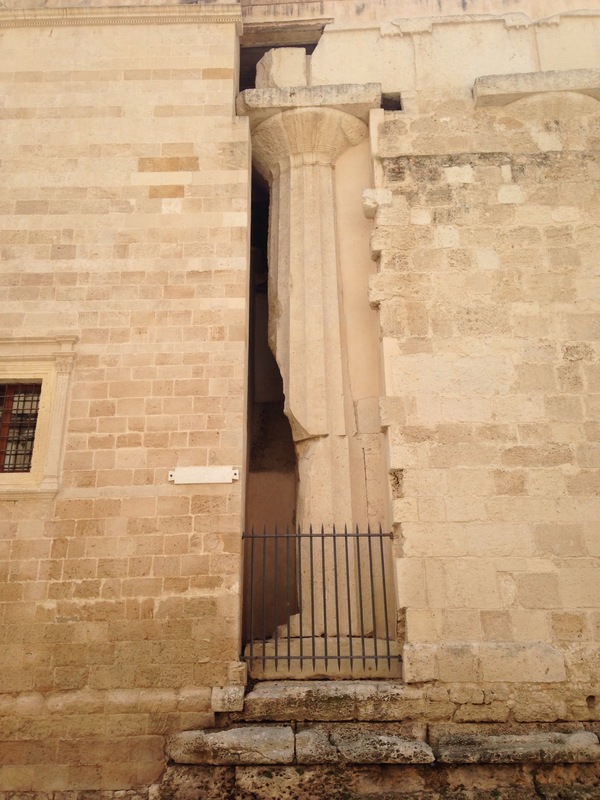 Much like a chameleon, this Doric column camouflaged itself within the wall of Siracusa’s Duomo, staying hidden from the gang while it took in the Sicilian night life mere hours before this picture of such an elusive object was taken. Upon entering the facility, I decided every church should be built around the model of a Greek temple. The Duomo’s central naves are framed by the Doric columns later architects decided to preserve and work with, creating, in my opinion, a sublime and ultra-holy space of worship. In general, I am perturbed when humanity builds over ruins or other places of worship to create their own holy spots, as much of Christian Spain did after 1492 when demolishing mosques and churches in their stead, but I feel this Duomo did a sound job of preserving and balancing the art of the Greeks with their own culture. Today the gang travelled through time. We had spent much of the trip visiting ancient ruins, but today we entered Sicily’s Baroque era in the quaint town of Noto. Evident upon the sandy church pictured above are a number of Corinthian columns borrowed from Greek architecture, all the while juxtaposed with statues of religious figures sculpted into the natural convex and concave curves of the building, and finished with brushstrokes and thickets of iron bars framing the church’s many windows. 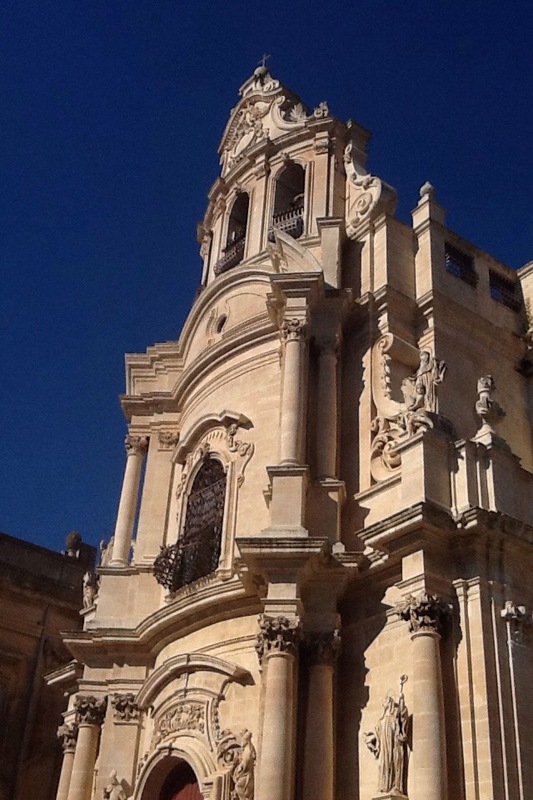 Decades ago, the countless sandy buildings of Noto and surrounding towns fell victim to a devastating earthquake, rendering the collapse of a central baroque cupola and many reconstruction projects. The gang is blessed to see these buildings standing on Day 7, and to understand the influences the Greek world had on the evolution of architecture. 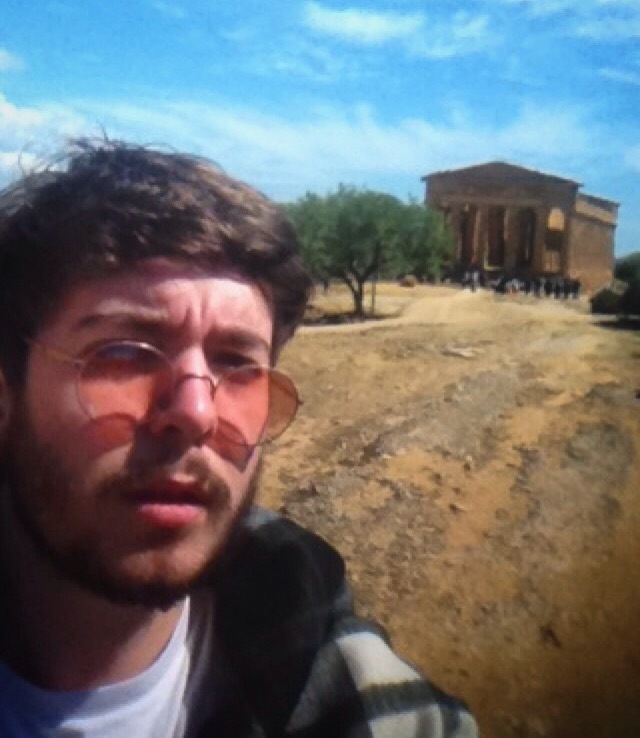 Day 6 meant one Dylan Johnson had the privilege of viewing UNESCO World Heritage’s poster-boy temple, the Temple of Concord. 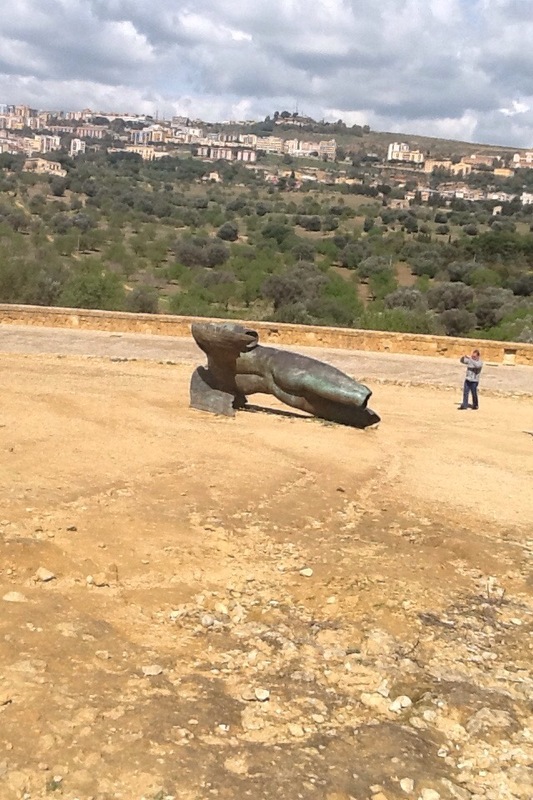 I viewed this architectural masterpiece while in a park in Agrigento that was filled with countless other ruins and wonders, like the grand, fallen temple statue below, but, just like UNESCO, I fell in love with Concord. Concord has a perfect 6:13 column ratio (as the ideal ratio is n:(2n+1), and it is among the most well-preserved temples of its kind (Corinthian).